With less than 24 hours left before setting out on our Advocacy Adventure, critical decisions remained. Route, timing, where to stop, what to carry, and all the usual pre-ride details that I typically cram into the last 15 minutes before departure still remained unresolved. But this would be different. Ted and I were looking at a longer ride than either of us had done for quite some time. By Ted’s admission, 50 miles in one day was the longest he could recall, and while I have had some experience with longer rides, that’s all in the distant past. The biggest question remaining on Sunday before our Monday launch was What bike would Ted ride? 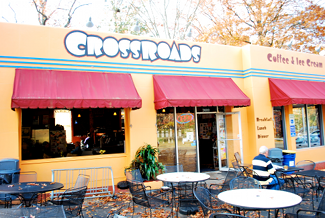 To help with the decision, we organized a brief excursion to Crossroads Coffee and Ice Cream, adjacent to Forest Hill Park on the South side of the James River. Ted chose my trusty Schwinn Traveller, rigged up with seven manually selectable forward speeds, cowhorn bars and a longish stem. Although he successfully made it out and back, and enjoyed a veggie breakfast burrito in the process, he deemed the Schwinn too “wobbly” for his tastes. Wobbly is not a word I typically associate with brazed lugged classic chromoly frames, but perhaps it carries a special meaning in the world of widdle biddy wheels where Ted does most of his commuting. As we say here in the South, de gustibus non est disputandum, y’all. His next choice was the Raleigh Classic Roadster with three, (yes three!) distinctly different gear ratios, selectable by rotating a clever mechanism on the handlebar. (What will they think of next!). Based on an extensive tour of the hallways in Artspace, a totally cool factory converted into art studios (and one loft apartment) where I reside, Ted confidently concluded that the Raleigh was the ideal machine for the trip to DC. Great ride up to Fredericksburg. Brought back old memories of the Ashland Breakfast Club ride, a tradition of RABA (Richmond Area Bicycle Association). It’s a roughly 20-mile run from Laurel Park Shopping center to the Center of the Universe (AKA Ashland Virginia) where everyone stops at Hardees and has a breakfast biscuit with country ham. We made it a little longer, starting as we did in Manchester, South of the James. I didn’t know what to expect of Ted (or myself) given the limited distances we typically ride, but it was pretty much a breeze to Ashland. Things got a little monotonous out on Route 1 North, at least until Ted saw the “Lee’s Movements” sign. That seemed to energize him somehow, and for the rest of the trip we looked for equally profound historic markers (which are as common as Starbucks in the Old Dominion) until we rolled into historic Fredericksburg a little after dark. The next morning, it was a bit of an adventure putting our bikes on the double-decker train cars of the VRE for an easy leg up to Woodbridge, where we re-commenced the human powered portion of our epic journey. Oddly, Amtrak, with relatively low ridership and a focus on tourism and inter-city travel, makes a big deal out of taking your bike on a train. Only some trains have baggage cars, and you have to box your bike just to get them to take it. VRE, however, on the same tracks, is a commuter line, and they have no problem handling the limited number of multi-modal commuters. Just carry your bike on, bungee it to the side of the car, and off you go. Their cars are pretty much full, every trip – while Amtrak is dying for lack of ridership. I think there is a lesson in there — something about Federally-funded infrastructure getting its priorities all wrong. I would be remiss if I neglected to mention one of the best new cycling accessories I have discovered in a long time. Sport Beans by Jelly Belly. You might assume that these miniature sugar pills are just super expensive versions of already overpriced undersized jelly beans, but you would be wrong! They actually pack more punch than a Powerbar soaked in Gatorade, and they taste better too! I am certain that without them, we never would have made it to Fredericksburg. At the end of last year’s summit, we made great sport out of my passing resemblance (especially when viewing the back of my head) to Andy Clarke, Supreme Potentate of the League of American Bicyclists. So you can imagine my glee, when, upon first meeting Diane Lees, Outspoken Cyclist Extraordinaire, before I had even registered, she gave me a huge hug before realizing it was only me, and not Andy. This would be a continuing theme throughout the Summit. The keynote speaker on Tuesday night was Mark McKinnan, a highly accomplished political imagemaker, who gave us a few pointers on the art of political persuasion. Showing his selection of the best political ads and speeches of all time, he emphasized the value of repetition of a concise and crafted message. In one hilarious example, he showed excerpts from a Bill Clinton speech where the Big Bubba said “Build a bridge to the 21st Century” something like 22 million times. This got big laughs. I think Clinton was even laughing by the end of the speech, The next day, we were all talking about building bridges. In a lively session on the gap between the racing and advocacy communities, one of the organizers of the “Tim Johnson World Cyclocross Champion Ride on Washington” got all assertive-like demanding to know, “Where are all the big time advocates? Why aren’t they here listening to our awe-inspiring tale of riding all the way from Boston to raise money?” or words to that effect. Apparently he hadn’t noticed when Andy Clarke slipped into the room — or maybe he thought it was just me. In response, the one and only Gary Fisher, sartorially splendiferous in his full length “Texas Ranger meets the Artist Formerly Known as Prince” duster coat, purple bucket hat and matching purple diamond spectacles, became somewhat agitated, stood up and turned to face the supercilious cyclocrosser. Gesticulating wildly and lapsing into some Klingon dialect that I could not quite make out, he nonetheless generated considerable applause and amusement. Over self getting excellent would be young hairless one! Real advocates working hard are all the time while drinking beer and posing for pictures you are! I, Fisher, Gary, creator of biking on mountains spanking you hard will be until shutting up you are. Clearly there is still a bit of a gap between these two constituencies but maybe events like the 2015 World Cycling Championship in my hometown of Richmond can help advocates build a bridge to the 21st century racing community. Did I just say, “Build a bridge to the 21st Century?” Why yes, I think I did. I think we should in fact build a bridge to the 21st century racing community. I learned a new “ism” at the Summit. Tactical Urbanism. Hoping it might involve camouflage and paintball guns, I sat in on the session entitled “Boosting Economic Vitality in Cities” at which, I was led to believe, the distinguished panel would elucidate this intriguing concept. Sadly, real Tactical Urbanism requires neither paintball guns nor camouflage, and my images of splattering red-light-running fixie hipsters with full-auto rainbow bursts of water-soluble paint packets quickly evaporated. My initial disappointment, however, turned to intense curiosity as Mike Lydon, Andy Hanshaw and April Economides fleshed out the true meaning of the term. Listening to the presentations and learning about Bicycle Friendly Business Districts got me thinking we are doing this all wrong and we need more smart women like April in positions of influence (no offense Andy and Mike, but you didn’t quote my article in your “presos”). April’s description of the implementation of Bike Friendly Business Districts in Long Beach, to my mind, offered the most detailed and inspiring examples of the concept. To sum it up, permit me to generalize: Men (and most commuters and advocates are still men) like to solve the problem, crush it!, win the debate!, pass laws!, make rules!, build stuff! — and spend money! If that starts a fight, all the better. We men all love a good fight now and then (even whiny pinko liberal types). Meanwhile, ladies like April, Mia Birk, Elly Blue and our own Amy George here in Richmond (She was on Jeopardy!) are out there changing things from the bottom up in a distinctly different way. They are creating demand from business owners for bike friendly policies and improvements by demonstrating what can be done with minimal outlays and maximum impact. Now if they can just figure out how to make our predominantly male politicians and planners think it was all their idea, they might actually agree on something bi – or better yet non-partisan. But my conservative instinct tells me we should leave it alone, and just get out of April’s way as she quietly transforms Long Beach into one great big BFBD. It’s like gardening. Men want to pull stumps, roto-till the backyard into neat rows sprouting tall stalks of something — anything. Women are more likely to carefully choose the right plant for the conditions, dig a little hole, fertilize it just right and roll their eyes when tractor man says “Why doesn’t my stuff grow like yours? Look at all the dirt I moved, all the bags of cow dung I dragged in with my John Deere! It’s not fair!” I know, that sounds terribly sexist of me — but I’m old and conservative, right? The closing reception was over and so there I was, walking into the nearly empty hall in the Dirksen Building, when it happened again – an advocate approached me, took my hand, then my elbow and deeply, sincerely, from the bottom of her heart began to thank me for, as far as i can tell, looking somewhat like Andy Clarke. I politely explained that I was not entirely responsible for her rewarding experiences over the past two days, but would be happy to convey her gratitude to Andy when next I saw him. Blushing, she laughed and apologized, I said “no need, it makes me laugh!” and we parted. I strode into the hall, and instantly, I was again approached. Again, the hand, the elbow, the deep, sincere eye contact….I started to explain, but before I could complete my standard “I’m not Andy” spiel, a photographer was motioning for me to move in closer so he could get a shot of another advocate thanking …the wrong person. This is all quite amusing to me, and curious in a way, because when I am not among fellow cyclists, I am more often mistaken for George Clooney or Daniel Day Lewis. Realizing that I had a long ride ahead of me, (or two medium rides and a night at Motel 6), I made a tough decision and bailed on the DC Bike Tour Friday morning to head straight for Richmond. More or less retracing the path Ted led us into town on, I made my way to the Lincoln memorial, only to find myself taking an extra lap before finding the best way onto the right bridge across the Potomac. From there, it was back to the Mount Vernon Trail, through Old Town Alexandria (best seen by bike), past Reagan Airport, and then along the river towards Mount Vernon. I tailed him (her?) for a little while but let him get away on principle. Made my point though, I think. The rest of the ride was a mixture of sidepaths, turning lanes, more than a mile or two of sidewalks, and generally wide shoulders as I made my way South along Bike Route 1 through Lorton, Occoquan, Woodbridge and on past Quantico to Fredericksburg. Route 1 was busy, but traffic doesn’t bother me too much, and it was also nice to know that at any point I could have hopped on a bus, loading my trusty Sprite onto a rack just like the ones we have here in Richmond. Crossing the Rappahannock was a milestone, as I rolled into old town Fredericksburg. Fredericksburg is sort of like a mini-Alexandria, but with more antique shops. Also one excellent bike shop on William Street where the owner not only cleaned and lubed my chain for free, but even printed out a cue sheet for the rest of my ride home. BikeWorks, a Raleigh dealer by the way. By the time I made Thornburg, VA, the sun was setting. Finding no Sport Beans at the local convenience store I settled for a five ounce bag of Wonka Sluggies, (Made with 25% real fruit juice!) and polished off the last of my warm coconut water. Opting to stay on Route 1 as southbound traffic was exceedingly light, and the shoulder accommodating, (at least until the Caroline County Line), I marked my progress by the rivers I crossed: The Ni, the Po and the Matta, which flow together to form the Mattaponi, (also the name of a local native American Tribe), and the North and South Anna Rivers, each in turn extended the blue line a little further south on my mental GPS display. Soon I was counting down the miles to the Center of the Universe (Ashland, remember?). Twenty two… 17… 12… 5 miles and then I hit England Street, home of the Olde Towne Bike Shop where Ted and I stopped on the way up. Closed of course, it being about 9:30 on a Friday night. But Ashland Coffee and Tea, known for its hip and easygoing atmosphere and nightly live music, beckoned me like the Sirens of the Odyssey. Soon I was locking the Raleigh to a strong rack out front and found myself engaged in a bizarre conversation with a bearded local twenty-something who was sitting outside having a smoke and reading some pretentiously avant garde paperback novel. Little did he know that I actually (sorta) know Tom Wilson aka Biff, from Back to the Future. He’s my former secretary’s big brother. So there, college hipster know it all. As I sat in the lounge area, the fine bluegrass of The Whiskey Rebellion wafting through the curtains separating me from the paying audience, three painted turtles stared at me from the wall facing the couch as I rested my legs on a Thomas the Tank Engine train layout serving as a coffee table. My right leg started to cramp up and I stood up to shake it off, then wondered if the other patrons thought I was trying to do some kind of Jed Clampett Hillbilly Stomp to the music. Cramp fading, with my large Coke and equally large ice water now empty, I knew it was time to get back on the road, but not before Whiskey Rebellion played a fine bluegrass-inspired version of The Talking Heads’ Psycho Killer, followed by the fiddler’s classic Orange Blossom Special, with an interesting twist as they smoothly segued into a verse or two of the Ballad of John and Yoko before wrapping up the show with a hot fiddle improvisation. Enough surrealism for one night, I said to myself, and bidding the turtles goodbye, I decided to get moving before things got weirder still. From Ashland, it literally felt like it was all downhill as I rolled into Richmond on Brooke Road. Easiest 22 miles of the whole trip. Turning off Brooke onto the bike lane down Lombardy, left on Broad, right on Harrison, with its freshly painted sharrows, then left on Franklin, then right on 3rd at the Bike Route 1 sign. Finally turning left onto Cary, coasting past my office, and I was on my regular commute across the Mayo Bridge to Manchester. Dozens of fisherman casting for shad lined the sidewalks, and one almost hooked me with his cast as I passed behind. I rolled into the building at midnight sharp, started this post and then climbed into my loft for a well earned night’s sleep. Awakened by the sound of heavy rain in the morning, I knew I had made the right decision to press on through from DC to Richmond in one day, and felt very satisfied knowing that my minimal mileage commuting to work everyday had prepared me so well for my epic ride. Good article, Tom. Now I understand your reference to Klingons on Facebook with your link. (Although Yoda was someone else’s intellectual property.) BTW, although it doesn’t quite equal your indirect connection to Biff, my cousin once bodyguarded for Bruce Willis at Tyson’s Corners. Tom turned left, breaking away from the Bike Summit Bike Ride about 8:45 AM. 9:58 PM Tom texted me about listening to Bluegreass in in Ashland. I thought, No way! 12:41 AM Tom texted me telling me he was home. I thought, No F! @#ing way! Wish I could take a 230 mile bike trip and call it “work.” Sure sounds like you had a good time. But I have a question: how did Ted get your other bike back home? Or did he raffle it off in DC for plane fare home to Flagstaff? A fellow VBF board member (who rode about 250 miles TO DC!) brought it home in his van. His wife met him at the summit and so she had a vehicle. Thanks again Joe! I was seriously remiss in not mentioning Kimberly Perry, Exec. Director of BikeVirginia in my list of the smart women doing great work in cycling. Although Kim does not focus on Advocacy per se, she orchestrates the BikeVirginia Tour and as I look at it through my new Tactical Urbanism lenses, I can now see how much BikeVirginia exemplifies the concept! I was born and raised in Virginia, all my professional degrees including the ones in law and nursing were earned in the public universities of this great state. The Navy hospital where I served my country is also located in Virginia. I happen to be a woman who rides a bike, actually several, including a road, mountain, and cross bike. I also commute to work sixteen miles round trip through the streets and roads of Northern Virginia. Having been educated in the finest Virginian schools I can assure you I solve problems according to my training, intelligence, and experience. Gender has nothing to do with it. I too expect to solve problems, spend money, and *make rules*. And I also expect nothing less than to *crush* it. The only difference is I paint my nails red and wear a rhinestone covered helmet. Ted, you’re just not used to big boy wheels. Tom, Great story. Thanks for representing our organization at the summit and sharing your adventure. Congratulations on the commute! Hi Tom, I didn’t realize you commuted to the Summit by bike as well! Very cool. Karen – what an Awesome ride! Was it rail trails all the way?